After I picked myself up off the floor I explained to her the joys of the Long John. For those that aren’t familiar with it, it’s basically a big long donut. The benefits of having a long straight donut are numerous. First, it’s easier to make. There’s no strange shapes to deal with like circles and holes. Heck no. Second, because of its shape, it’s perfect for filling with a delicious cream filling. Fine. Maybe they aren’t a quick breakfast dish, but they’re great for a weekend brunch! They’re worth the work people. 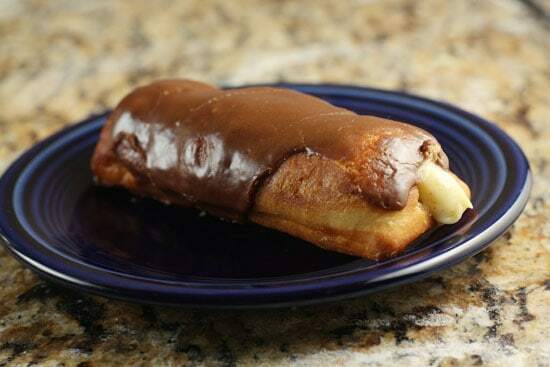 Long John donuts filled with a homemade vanilla cream mixture and glazed in chocolate and maple glazes. 1) For filling, whisk eggs with sugar in a medium bowl until they are nice and light. Then whisk in flour and cornstarch. In a medium sauce pan, combine milk, cream, and vanilla bean (scraped). Heat over medium-low heat until it’s just simmering. 2) Carefully whisk hot milk mixture into egg mixture, working with a bit of liquid at a time to slowly bring up temperature of eggs. Once both mixtures are combined, stir in extract and return everything to sauce pan. 3) Cook over low heat, stirring constantly, until mixture thickens, about 2-3 minutes. You can store this in the fridge for a few days. Place plastic wrap right on top of filling so a film doesn’t form. 4) To make donuts, combine milk and water in a mixing bowl. Add yeast and let sit for 5 minutes until yeast foams. 5) Add all other ingredients, flour last, and mix with a dough hook until dough forms a soft, but not sticky ball. If it’s sticking to the bowl, add more flour. If you don’t have a mixer, you can just use a wooden spoon. 6) Dust dough with flour and let rise for 2 hours or until it doubles in size. 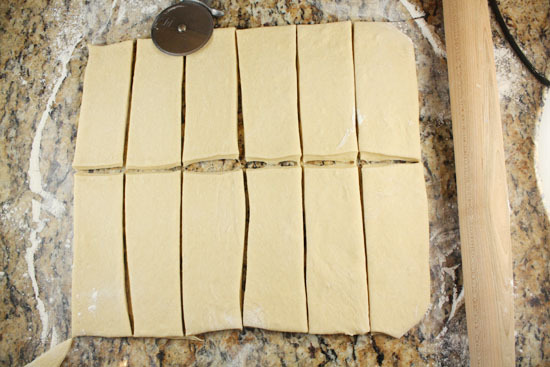 7) Roll out dough on lightly floured surface into a 12×18 rectangle. Slice into 12 even rectangle pieces. Let pieces rise for 15 minutes or so. 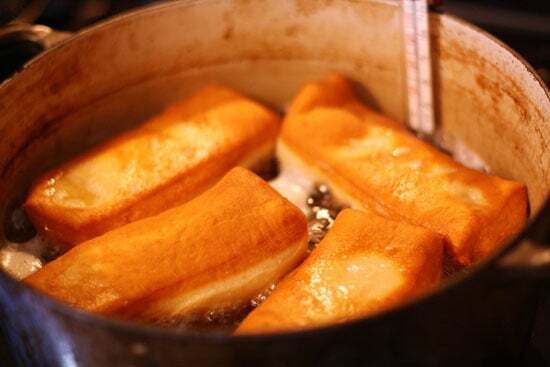 8) Fry donuts at 350 degrees for 2-3 minutes per side. You’ll have to flip them because they float. Remove donuts to drain on a paper towel or on a wire rack. 9) For glazes, mix liquids in a saucepan over low heat until hot. If you’re using chocolate, melt it in pan. Then whisk in powdered sugar until glaze is thick, but pourable. 10) To fill donuts, use a long narrow knife to hollow out a cavity. 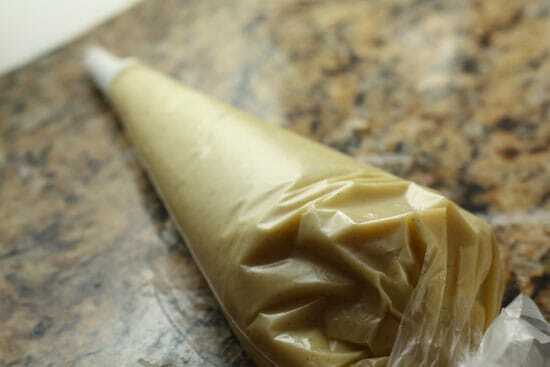 Then pipe in filling using a pastry bag. It’s helps to have a helper for this part. 11) Dip donuts in glaze after they are filled (or you can skip the filling). Let glaze harden for a few minutes. Eat as soon as possible! WHOA. Longest ingredient list ever right? Well, don’t freak out. It really isn’t that bad. For starters you don’t need to do both the chocolate and maple glaze obviously. Just giving you options. And if the filling is intimidating, there’s nothing that says that these have to be filled. They are perfectly delicious without it. But assuming you do want to make the filling, it’s really tasty and can be made a day or two in advance. If you’ve ever made any kind of custard before, this is basically the same process. The only difference is that the addition of some flour and cornstarch makes the filling really thick which is what we’re going for. Start by whisking your yolks and sugar together until they are nice and light. Then whisk in the cornstarch and flour and set this aside. In a medium saucepan, add the milk and cream and scrape out all the insides of a vanilla bean. Bring this to a slight simmer over medium heat. Stir it constantly to make sure the milk doesn’t scorch. Once the liquid is simmering, temper the hot milk mixture into the egg mixture. 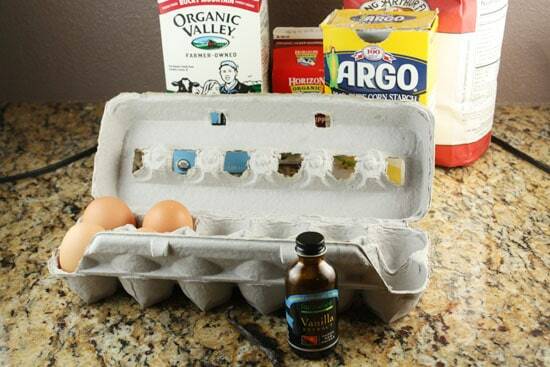 If you’ve never done this before, basically just whisk a tiny amount of the hot milk (1/4 Cup maybe) into the eggs. Whisk furiously. Keep doing this a bit at a time and it will slowly raise the temperature of the eggs without cooking them solid. Once your milk mixture and egg mixture is combined, add in your vanilla extract and return this to the pan over low heat. 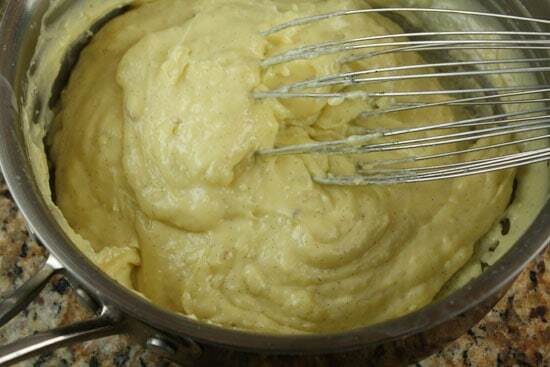 Whisk continuously and after a minute or two it should really thicken up until it’s hard to stir. That’s when it’s done! It should be really thick and creamy. You can store this in the fridge for a few days without a problem. Just be sure to press some plastic wrap directly on top of the filling to prevent a thick film from forming on it. Ok. Down to the main event. Donut dough is an enriched dough which just means it has eggs and milk in it that make it a lot easier to work with than a standard bread dough. Start the dough by adding your milk and warm water to a bowl of a stand mixer, or just a large bowl if you don’t have a mixer. Add the yeast to the liquid and let it sit for 5 minutes. If it starts foaming then you’re ready to go, if not then you need new yeast! Slowly stir in all the dough ingredients, adding the flour last. Mix with a dough hook for a few minutes until the dough comes together. Again if you don’t have a mixer you can just stir it all together with a wooden spoon. The final dough should be soft, but not sticky. 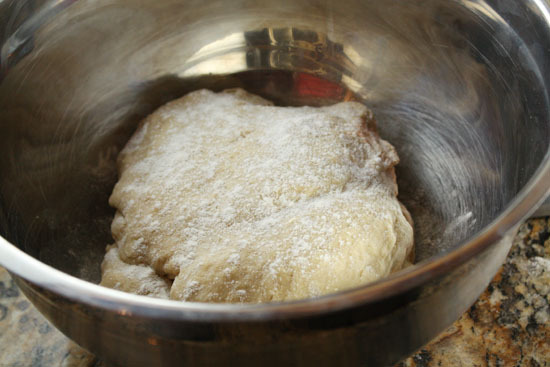 Keep adding flour until you get to a dough that’s not sticking to the sides of the bowl. 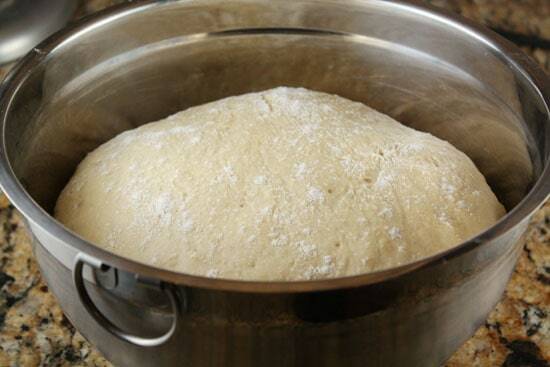 When your dough is done, dust it with some flour and let it rise for about 2 hours. It should more than double in size. Then turn the dough out onto a floured surface, roll it into a large rectangle. I went for one that was about 12 inches by 18 inches. Then take a pizza cutter, dough cutter, or just a knife, and slice the dough into 12 even pieces. This part is easier than donuts if you ask me. Let these guys rise again for maybe 15-20 minutes. Meanwhile you can prep your fry station. I like to use a heavy pot for frying and you probably only need about a quart of oil. As with any frying situation, the really important part is the thermometer. It’s pretty hard to get a good fry set-up without one. Anyway, fry these guys for about 2-3 minutes per side (you’ll have to flip them because they will float) at 350 degrees. When they’re done, take them out and let them drain on some paper towels or on a wire rack with paper towels underneath to catch any dripping. Once you get all your long johns fried up, you can glaze and/or fill them! One thing I learned, if you care about how the donuts look, fill them before you glaze them. Filling them after you glaze them will cause the glaze to crack a lot and they just won’t be quite as nice looking. To Fill, assuming that you probably don’t have an official donut filler, you’ll have to improvise with a pastry bag. Just shove all your filling into a clean bag and put on a pretty big tip so the filling can come out easily. A helper helps for this. Then take a long narrow knife (butter or steak knife works well) and hollow out a cavity in each long john. Try to be careful not to puncture through the donut. Then hold the donut in one hand and the pastry bag in the other and fill it up! In practice, I found that it helps to have a helper for the filling part. So maybe recruit a friend. You can pay them in long johns. To Glaze, for both glazes heat the liquid ingredients and butter until they are hot, but not simmering over low heat. If you’re doing chocolate, melt the chocolate into the liquids. Then remove from heat and whisk in the powdered sugar until the glaze is nice and thick. You can play around with the consistency. Ideally, you’re looking for a glaze that sticks well to the donut but isn’t super-heavy. Then just dip the donuts in the glaze and let them sit for a few minutes to harden. The finished product with the glaze and filling is really almost a work of art. It should go without saying that these are best to eat as soon as possible. Even 24 hours later they lose some of their amazingness. If you need to store them though, do so in the fridge. Donuts are really fun to make and there’s really nothing like a fresh donut out of the fryer, especially if it’s filled and glazed! What do you think? Too much work or a fun weekend project? Sweet merciful crap. I need to make those. Need to. In upstate NY we call these "kiglies" (spelling is probably wrong) and we eat them with the chocolate frosting on top sans filling. So good. Wow, I had never heard of these before. It seems long but fairly easy!!! Mmmm. I'm tempted to use the maple glaze and then trade the filling for a strip of bacon on top. Yea.. very similar. eClaires are normally made with pate a choux though and baked I think. Wow! I'm definitely going to have to make these. Diet wrecker! ;-) And I'm in complete disbelief that Betsy didn't know what a long john was!!! Yea. Tell me about it! I had also never heard of a Long John, but I'm glad you introduced me! These look like a really fun Saturday morning project! Great picture of the final product! Learn something new everyday. I learned that Long Johns are donuts and they are a lot of work, but must be good, because you did it. They look a lot like eclairs, and boy do I love eclairs. Seems like a fantastic way to spend a weekend. WOW! THese would be great for chanukah! Love that you posted the photo of the ingredients you use, I only have one thing to say about your choice of cornstarch:be aware that ARGO and most store brands contain GMO (genetically modified organisms) I avoid these by using organic cornstarch. Frontier and Bob’s Mill are two such brands you can trust, but besides that, I am making these ASAP!!! Ohhhhh yessssss. This is the Long John. My favorite donut. The ultimate way I like to have them is when the filling is white like the color of snow.I don’t think this vanilla cream is that, but vanilla cream is also delicious.I grew up with these in Indiana. I now live in New Jersey and ask often at the order windows for long johns and they say,” a what????? ?” now I can make my own.thank you thank you thank you. We call them “bars” in Oregon. I was shocked, horrified, and actually cried when I moved to Cincinnati and cannot find Maple bars, much less chocolate or plain glazed bars. Someone from the east coast asked me if I’d ever had Long Johns and my response was the same as Betsy’s. Donuts are seriously tricky regional business. 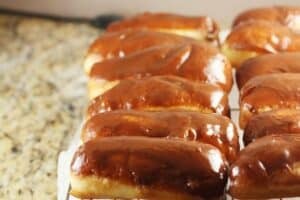 I can’t just ask for a glazed raised (OR) or a glazed yeast (New Mexico/Texas) in Cincinnati…I have to ask for a glazed round. Despite the fact that all of their donuts are round. Only the yeast ones are called rounds. I find it highly distressing. I’m a linguist, and I love language variations. But not in donuts. That is apparently where I draw the line. Ha! It is complicated business Ani. Thanks for some regional donut knowledge! I used to get these every morning on my way into work. I’ve since moved away from my favorite store, which was the only place here in Maine I could seem to find them!! Only difference is, they used a two part filling – one half was almost like a cream horn frosting filling, and the other half was a jelly, of which they had several flavors to choose from! They were piped in side by side into the pastry. Since I moved, I’ve been trying to find a good recipe for the pastry portion, as I know how to make the frosting and jelly fillings!! Thank you so much! And for others like myself (who don’t care for custard) the frosting/jelly filling is fantastic in these. Recipes for the fillings please!!! Has anyone ever had the white cream filled ones topped with buttercream and coconut?? Use to get them with my grand pop in the coal mine region of PA! They were my all time favorite doughnut! Did you ever try baking them? If so, for how long? I grew up in Ohio and we called them cream sticks and the cream on the inside wasn’t like that it was more fluffy kinda like in a lady finger cookie, but we moved to AZ and they don’t put cream in them out here so thank you for the recipe my family cant wait for me to make these they are so yummy and we all miss them. These sound just lovely and just like the ones the Polish bakery in Gaylord, Michigan, had when I was a child. They are hard to find here in Southwestern Michigan these days. Sometimes the supermarkets have them but they always seem to be about three days old. (Just not the same as the bakery where the owner would take your Long John into the back room and add extra filling if he liked you and you were a regular!) I will surely try this recipe. Thank you so much. 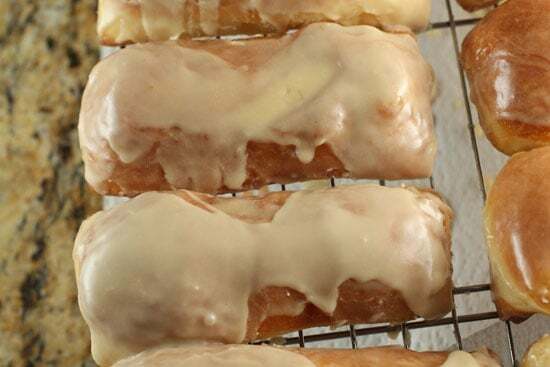 These are called custard filled maple bars in Oregon. My absolute favorite! !